ames Smithson (c.1765-1829), an 18th-century gentleman of science, included his library with his bequest to the United States, and those books now reside in the vault of the Smithsonian Institution Libraries’ Joseph F. Cullman 3rd Library of Natural History. The collection consists of 126 titles, primarily scientific monographs and journal articles, but also history and memoirs, political pamphlets, travel books and museum guides, and a few household items like cookbooks. A list of the collection was compiled by William J. Rhees, Chief Clerk & archivist of the Institution, and published in 1880 (pp.62-67 in the volume James Smithson and his bequest, and again in the following year as no.330 in the Smithsonian Miscellaneous Collections); Rhees lists 116 titles, but two seem to refer to the same work. It is probable, however, that this is not Smithson’s entire library, since numerous publications basic to his scientific studies – by men whom he knew and worked with – are not present. Heather Ewing’s biography The lost world of James Smithson (Bloomsbury, 2007) notes that he lost a trunkful of books in 1795 when he had to flee Naples ahead of the invading Napoleonic armies, but the contents of the trunk and the rest of the history of his books remain a mystery. Nevertheless, the collection of books that came with the bequest remains a useful source of contemporary information about Smithson’s work and the scientific world in which he moved. Inscribed and annotated volumes (of which you can see many examples by clicking on the link below), as well as multiple copies of one of Smithson's own publications that he would have sent out to colleagues in exchange for theirs, reflect the era’s methods of scientific communication and provide the raw material for understanding the intellectual networks of the period. Click here to see a sample of pages from James Smithson's Library that the Smithsonian Institution Libraries have digitized. Interestingly, with very few exceptions Smithson’s books remain in their original paper wrappers, as he would have bought them from booksellers. 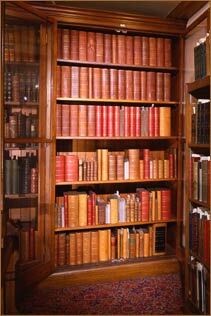 (The leather spines in the picture here are mostly slip cases made for the books in the late-19th-century. A few of the photographs in the link above show the original paper wrappers, some plain and some marbled or printed.) Even as late as the early 1800s, books were not commonly sold in what we would consider a finished form, namely with hard covers – that was for the purchaser to decide on and pay extra for. Gentlemen of his social class and wealth typically had their books bound in elegant, decorated leather; most unusually, Smithson apparently chose not to trouble about such things, and we can only conclude that he looked upon his books as a working library. The Smithson library provides a rich resource for historians of both science and book-making, for biographers and bibliographers alike.